Submitted by mahoney on Tue, 03/25/2008 - 2:40pm. Pizza Hut locations across the USA and Canada...Pizza Hut Inc. is a fast food restaurant chain and international franchise based in Addison, Texas, USA specializing in American-style pizza along with side dishes including (depending on location): buffalo wings, breadsticks, and garlic bread. 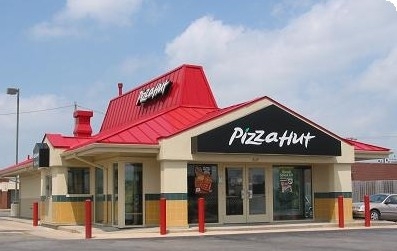 Pizza Hut is the world's largest pizza restaurant chain. Added Canadian locations(218) to the file. The official Pizza Hut website locator was used to verify all of these Canadian locations. GPS visualizer was used to obtain the coordinates for the new locations. The file was renamed to reflect the addition of the Canadian locations. Completed the update of FL. Net increase of 118 locations. Completed the update of CT, DC and DE. Net increase of 11 locations. Completed the update of CO. Net increase of 30 locations. Completed the update of CA. Net increase of 225 locations. Completed the update of AZ. Net increase of 42 locations. Completed the update of Arkansas. Net increase of 12 locations. Completed the update of AK and AL. Net increase of 10 locations. Pizza Hut Express locations are now included in these 2 states. Location in Kill Devil Hills,NC is closed. Added a new location on Wickham Rd, Melbourne,FL Same bldg has Taco Bell. Corrected the coord for the location in Mt Dora,FL. Updated the file. Net increase of 50 locations. Added a new location at 16873 E Colonial Dr, Orlando,FL 32820. Corrected the coordinates for the locations in Hillsville,Va and Pulaski,Va. Completed the update of the Canadian locations. Net increase of 17. Updated the USA portion of the file using the latest website data. Added 79 and deleted 26. Corrected the coordinates for the location in Houghton,Mi. Completed comparison of the file to the website locator. Net increase of 154 locations. Corrected the coordinates for the location in Covington,Va. Updated the file. Net increase of 95 locations. Also added numerous missing phone numbers. File updated: Completed verification of locations in the file to the Pizza Hut website locator. Corrected the coordinates for the Waynesville,NC location. Added missing locations in Tn and Va.
Added Canadian locations(218) to the file. Deleted 1429 Lehigh St, Allentown,PA location, due to closing. Changes made to various FL locations. Corrected coordinates on 179 E Cocoa Beach Cswy-Cocoa Beach-FL location.